Queen Beedz, a client of the Illinois Small Business Development Center (SBDC) for the Metro East at Southern Illinois University Edwardsville since 2017, will now have its jewelry available at Restoration Alley DIY Studio & Handmade Market in Ellisville, Mo. Queen Beedz owner Susan Hackney is thrilled to be able to work together with Restoration Alley owner Jennah Jahn, who is a like-minded, driven entrepreneur. Throughout her relationship with the SBDC, Hackney has received consistent support from Director Jo Ann DiMaggio May. 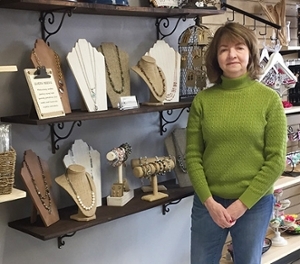 When Hackney was struggling to find opportunities to showcase her jewelry, May was able to reduce the stress by helping Hackney find events that were a good fit to help promote the business. “Jo Ann has been able to find shows and events prior to the sign-up deadline. This helped tremendously by providing enough time to prepare without feeling disappointed about missing an opportunity,” Hackney said. Although Queen Beedz started as a hobby for Hackney, it has quickly turned into something much more and has continued to grow. Hackney is always looking for shops that align with her values and style of jewelry. Queen Beedz’s newest product is a modern line of essential oil bracelets, earrings and necklaces. Hackney is also implementing more casual jewelry to keep up with the popular trends. She pays attention to her customers’ suggestions, so she can better serve her clientele. Queen Beedz can be found at many art fairs and maker’s markets in the surrounding areas of Illinois and Missouri. Her upcoming events will be in Alton and Kirkwood, Mo. Contact Queen Beedz at 618-877-3341. For more information, visit Facebook. Visit Restoration Alley DIY Studio & Handmade Market at restorationallydiy.com or on Facebook. The Illinois SBDC for the Metro East assists start-up ventures such as Queen Beedz as well as existing businesses headquartered in the nine-county region of Calhoun, Jersey, Madison, Bond, Clinton, St. Clair, Washington, Monroe and Randolph. It is funded in part through a cooperative agreement with the U.S. Small Business Administration, Illinois Department of Commerce and Economic Opportunity, andHYPERLINK "http://www.siue.edu/"SIUE as a service to Illinois small businesses. By aiding entrepreneurs and companies in defining their path to success, the SBDC network positively impacts the Metro East by strengthening the business community, creating and retaining new jobs and encouraging new investment. It enhances the region’s economic interests by providing one-stop assistance to individuals by means of counseling, training, research and advocacy for new ventures and existing small businesses. When appropriate, the SBDC strives to affiliate its ties to the region to support the goals and objectives of both theHYPERLINK "http://www.siue.edu/business/"SIUE School of Business and the University at large. To learn about the SBDC, contact theIL SBDC for the Metro East at SIUE at (618) 650-2929. Photo: Queen Beedz owner Susan Hackney.